LAKE OSWEGO – Like many new developments, Patrick Kessi’s 200-unit luxury apartment project started with a relationship. 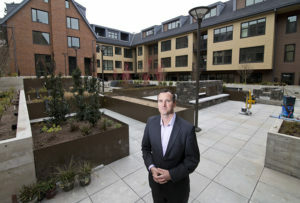 Around a decade ago, Kessi served on the University of Portland board along with Gene Wizer, a local businessman who owned a keystone block in downtown Lake Oswego. Wizer had long had notions of redeveloping the block, which was home to small shops, and had discussed the possibilities with a succession of developers. The recession scared off most firms. With few developers interested in tackling a big project, Wizer asked Kessi for his impressions. Kessi liked what he saw. Lake Oswego’s community could support an expensive project. The city had invested in the area, and opened Millennium Plaza Park. Another developer built Lakeview Village, bringing high-end shopping to the neighborhood. Housing could be the missing ingredient, Kessi thought. Read the full article here (requires subscription). 3330 NW Yeon Avenue, Suite 210, Portland, OR 97210 I 503.248.9370 I Copyright © 2017 PHK Development Inc. I FINE PRINT I PHK ® registered in U.S. Patent and Trademark Office.